PCTRAN is a Windows PC-based application specifically designed to model nuclear power plant and radiological dispersal device (RDD) events for emergency response planning. For nuclear power plants, the scope goes beyond that of normal training simulators to include core-melt and containment failure events. Plant specific models trace radioactive nuclide leak pathways through cladding, coolant and containment boundaries. PCTRAN models are also available that model releases from spent fuel or Radiological Dispersion Devices (“Dirty Bombs”). Real-time meteorological conditions are used in a Gaussian puff dispersion calculation for dose projection on an online downloaded map and used for event classification and protective action recommendations. This three-part system covers every type of radioactive dispersion event. It is intended for training and exercise development as well as real life accident management for both nuclear plant and public protection personnel. It has been nearly three decades since the NRC issued the “TMI Action Plan” (Ref. 1) that led to every nuclear power plant in the United States procuring a site-specific “full scope” training simulator capable of modeling all “design basis” events. Design basis events are analyzed in a plant’s Safety Analysis Report and assume a “single failure” in addition to the initiating event. Nuclear Power Plants are designed with redundant mitigating systems so that offsite radiological releases are well within allowable limits even with these “single failures.” The required scope of simulation for a training simulator does not include severe core damage such as occurred in the Three Mile Island accident. During a full-scale emergency planning exercise, a significant radiological release must be assumed to achieve conditions required to classify the event as a “General Emergency.” Simple “batch” files are often used to override simulator thermal-hydraulic and radiation transport models because severe core damage events are beyond the scope of simulation for training simulators. In many emergency planning exercises, this results in a decoupling between the plant data generated by the simulator and the radiological data generated by hand calculations, spreadsheet programs or estimated values. If the operating crew in the simulator during the exercise takes different actions than those taken during scenario validation, the radiological data may not reflect simulated plant conditions. The reactor’s core is not the only potential source for a radioactive release. The spent fuel pool (SFP) and dry storage facilities may have larger inventories of radionuclides such as CS-137. The potential risk of a release from a spent fuel pool was first analyzed in NUREG-1738 (Ref. 2). Using a conservative model, the results showed that under certain conditions, fuels discharged less than five years may heat up to cause oxidation of the zirconium cladding following a complete loss of spent fuel pool water inventory. This could potentially lead to a significant release of radioactivity from the facility. Since 9/11, there is increased concern that a fuel storage facility could become a terrorist target. 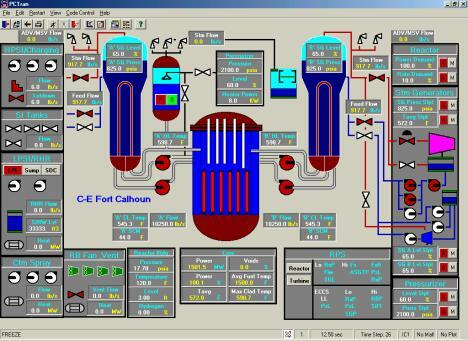 The Spent Fuel Pool version of PCTRAN uses a relatively simple thermal-hydraulic simulation model. Fission product release and transport are also modeled. Accelerated computation can predict the time to boiling and the maximum clad temperature. An explosive device designed to spread radionuclides is known as a radiological dispersal device (RDD) or “dirty bomb”. A RDD would likely contain industrial or medical radioisotopes. The psychological impact of an RDD detonation could far exceed the actual damage. A dose projection system could provide a quantitative estimate of potential radiation doses and might reduce the level of anxiety. In this paper, each of these models will be described. The nuclear power plant and spent fuel pool have been used successfully for years. The puff dispersion model and RDD simulator have been developed recently and are undergoing field testing. User feedback will be used to make future improvements in the combined effectiveness of these models. PCTRAN was first developed as a Microsoft DOS application in 1985 (Ref. 3). A reduced node thermal-hydraulics model was used along with reactor point kinetics to calculate the results of various plant transients and accidents. The original code was upgraded and converted to a Microsoft Windows Application using Microsoft Visual Basic. A user friendly graphical user interface (GUI) was implemented along with this upgrade. On a Pentium 4 / 1.90 GHz PC with 512 MB RAM running Windows XP, simulation speed can be varied from real-time to up to sixteen times actual speed. PCTRAN’s interface is very user friendly. Users can choose to have plant control systems operate automatically or they can be manually overridden. Numerous malfunctions can be initiated using a simple pull down menu. Valve position and pump status can be changed with a mouse click. Control system set points can be easily changed. The values of key transient variables are collected and can be plotted during simulation. The data can be saved in Access or Excel files for plotting after the simulation. Snapshot, restart, replay and backtrack capabilities are provided for documentation or classroom training. Figure 1 is the NSSS mimic of Fort Calhoun, a C-E designed PWR of 1500 MW thermal of Omaha Public Power District. The core is modeled into six vertical nodes. Each one generates a portion of the decay heat. During inadequate core cooling situations, the core nodes’ may heat up to fuel melting temperatures. Molten fuel and other core structural materials may combine to form “corium” and relocate to the bottom of the reactor vessel. The vessel lower head may then fail due to the extreme temperature allowing the molten corium to reach the containment cavity. A number of chemical reactions between the corium and containment concrete can generate additional heat and gases. PCTRAN results for the TMI-2 event as well as a large break LOCA with a coincident station blackout for the three-loop Westinghouse plant Maanshan in Taiwan have been benchmarked by comparison to the documented data and results of analyses performed using the severe accident code MAAP (Ref. 4) respectively . PCTRAN tracks fission product transport through release pathways. Plant area, process and effluent radiation monitor readings for various plant locations are displayed in a separate mimic. Concentrations of iodine, noble gases and other fission products listed in Regulatory Guide 1.183, Revised Source Terms (Ref. 5), are calculated at given time intervals for later use in dose dispersion calculations. Figure 2 is a containment and dose mimic for Ft. Calhoun station under hypothetical severe accident conditions; a large break loss of coolant accident (LOCA) without any ECCS. The core has melted and core debris is interacting with the concrete cavity floor. Micro-Simulation Technology Inc. partnered with Jerricho Solutions Inc. to develop a plant specific severe accident model of Omaha Public Power District’s Fort Calhoun Station. PCTRAN has been used for several years to train members of Fort Calhoun’s Emergency Response Organization in effective use of the plant’s Severe Accident Managements Guidelines. It has also been used to support emergency planning exercise development and provide reactor safety fundamentals training to plant operators and engineers. General Electric BWR 2 (Tsuruga-1 in Japan), 4 (ChinShan in Taiwan and Hope Creek), 5 (Laguna Verdi in Mexico), 6 (Kwosheng in Taiwan and Leibstadt in Switzerland) and ABWR (Lungmen in Taiwan) with Mark I, II, III and advanced containment respectively. In addition, generic PWR and BWR models are licensed to JAERI and NUPEC of Japan (current JNES) and the USNRC. PCTRAN is also licensed to the International Atomic Energy Agency (IAEA) and has been used as standard training material for its annual Advanced Reactor Simulation Workshop since 1996. Two Generation III+ models: Areva EPR and Westinghouse AP1000 have been successfully developed. With the exception of the generic models, all of the listed PCTRAN versions are site-specific and model each plant’s design. For site specific versions, reports were prepared to explain modeling methodologies. The reports also verified PCTRAN results using the plants’ SAR, documented operational event data and severe accident analyses using other codes. After the 9/11 attacks, concerns were raised about possible terrorist attacks on nuclear power plants, and, in particular, on their spent fuel pools. Events at shutdown plants involving SFP draining or evaporation followed by a zirconium fire have been previously analyzed (Ref. 2). This type of event could also occur at operating plants. Conservative modeling of such events, taking minimal credit for steam and air-cooling, may predict cladding fires for fuel assemblies that have been discharged from a reactor’s core for less than five years. Entergy Nuclear Northeast contracted Micro-Simulation Technology (ref. 6) to develop PCTRAN/SPF - a PC-based simulator to analyze the thermal-hydraulics and radiological releases caused by spent fuel pool accidents. Plant specific models were developed for the Indian Point (PWR) and FitzPatrick (BWR) plants. The plant specific models include fuel design and burnup, spent fuel pool inventory, storage rack geometry and cooling system design. Following as event such as a loss of cooling or a loss of coolant inventory, the times to bulk boiling, fuel uncovery and cladding fire are predicted. Fuel handling and criticality events can also be simulated with PCTRAN/SPF. 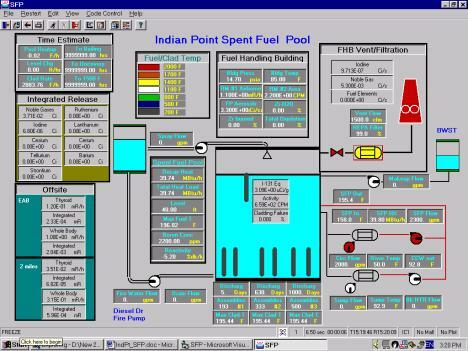 A graphical display of Indian Point’s spent fuel pool model is shown in Fig. 3. There is a cooling water system that transfers decay heat to the environment using heat exchangers. Regular AC-powered and emergency diesel-driven pumps are provided for coolant makeup. Simple point-and-click mouse actions on the computer display screen will disable or enable any of the components. When the fuel assemblies are uncovered and begin to and heat up, a color scale will indicate their temperatures. In addition to fission gases in the gap, damaged fuel aerosols such as alkali metals, tellurium, barium, cerium, lanthanides, etc. will be tracked. Building radiation levels are calculated and displayed on radiation monitors. Release paths through the building vents and walls are used to determine the site boundary doses. More recently, the NRC has conducted studies using more realistic models and published significantly improved results (Ref. 7). Steam and air-cooling is very effective in preventing cladding oxidation. Increasing the heat transfer coefficients used in PCTRAN/SFP for steam and air-cooling will result in maximum cladding temperatures below those required for cladding oxidation. Since the details of the NRC study are still safeguarded, benchmarking cannot yet be performed. Omaha Public Power District’s Fort Calhoun Station has used the generic version of PCTRAN/SFP to support “force on force” exercises. Medical and industrial radioactive materials could be used in a radiological dispersal device or “dirty bomb”. Potential radionuclides include Co-60, Kr-87, Ru-106, I-131, Xe-133, Cs-137, Pu-238 and Am-241. Explosives could also be used to disperse radionuclides from nuclear power plant spent fuel assemblies being stored or transported. Spent fuel assemblies contain noble gases (Xe and Kr), iodines (I), rare earths (Te, Sr, Ru, La, Ce, Ba, Co, Rb, Zr, Nb, Mo, Tc, Sb, Cs) and transuranics (Pr, Nd, Np, Pu, Am and Cm). The short lived radionuclides will have decayed away during the five years or so in the onsite spent fuel pool. The assemblies are then moved into dry storage waiting until they can be transported to a permanent high level radioactive waste disposal facility. RadPuff models the atmospheric transport of these radionuclides following an explosion. When a RDD explodes, much of the radioactive material is deposited relatively close to the site of the explosion. This material contributes to the “ground shine” dose. The rest of the material forms an aerosol that is released to the atmosphere and transported by the wind. A Gaussian puff model is used to model this dispersion and calculate downwind radiation doses. 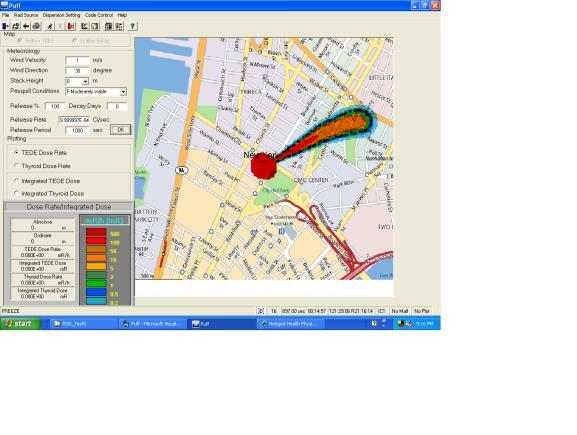 Radpuff uses a convenient user interface that downloads a map of the location of interest from the Internet. The map is used to display the results of dose calculations. Having generated the release source term from a power plant or a RDD, the Gaussian puff model and numerical techniques (Ref. 8) are utilized to calculate the radioactive effluent dispersion. During the transient simulation, puffs are sequentially generated and dispersed in all directions governed by the Pasquill stability category, wind velocity and wind direction. The thyroid and whole body dose rate and total doses at every spatial location in the neighborhood are shown as a color-shaded plot (Fig. 4). The releases of radioactive materials are treated as unsteady emissions in non-homogeneous dispersion conditions. The meteorological condition can vary between Pasquill stability category A (most unstable) to F (most stable), wind speed in meters per second and release elevation can vary from ground level up to a few hundred meters. The Gaussian puff model is used to predict the time-varying dose distributions. It is more realistic than the Gaussian plume model that assumes the emission is continuous and constant in steady-state meteorological conditions. The model describes the effluent dispersion in the horizontal and vertical directions. The thyroid dose rate calculation is similar to the CEDE equation, except that it uses the thyroid dose conversion factor. During a transient, colored contour diagrams of thyroid and TEDE doses (rate and integrated) are displayed on the map (Fig. 4). Users can click anywhere in the contours and the dose rate or integrated dose will be digitally displayed in the left panel. 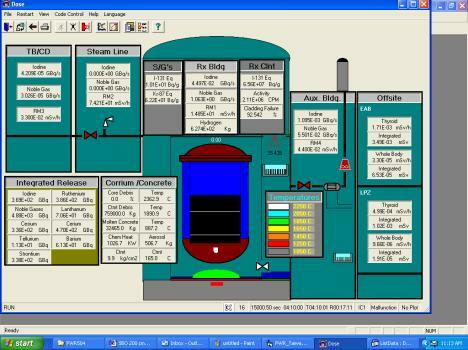 PCTRAN has integrated plant simulation with offsite dose projection. It goes beyond training simulators and conventional methods to cover all feasible radiological events. Having a comprehensive analysis tool for all foreseeable radiological events, power plants and others, is the first step needed to standardize the response process. Using this tool for training and exercises gives the staff a quantitative feel and realistic appreciation for the event. Should an event occur in real life, the tool can be used to make timely and precise projections of important events such as fuel uncovery, containment failure, pool boiling or cladding oxidation. The associated radioactive releases and downwind consequences can also be projected. For a radiological dispersal device set off anywhere in a responsible agency’s jurisdiction, the agency staff could use RadPuff to determine the area affected prior to the deposition of the radioactive materials. This would allow for timely implementation of protective actions. A package of all three modules: PCTRAN for nuclear reactors, SFP for spent fuel pools, and RadPuff for RDD forms a comprehensive accident consequence projection system. Over the years we appreciate continued support from the following organizations: Constellation Energy, Entergy, Finnish TVO, Florida Power and Light, German TUEV Rhineland, Hong Kong Government, HSK Switzerland, IAEA, Japan Nuclear Energy Safety Organization, Omaha Public Power District, Taiwan Power Company and US Naval Academy. The puff dispersion model is contributed by National Tsing Hua University of Taiwan. NRC document NUREG 0737 “Clarification of TMI Action Plan Requirements”, (1980). L. C. Po, “Analysis of the Rancho Seco Overcooling Event Using PCTRAN, ” Nuclear Science & Engineering, 98, 154-161 (1988). EPRI MAAP4.0.5 Users Manual (1994). Regulatory Guide 1.183 “Alternative Radiological Source Terms for Evaluating Design Basis Accidents at Nuclear Power Reactors” (2000). M. J. Slobodien and L. C. Po, “What about Spent Fuel Pool?” Proc. National Radiological Emergency Preparedness Forum in Milwaukee (2002). J. S. Schaperow, NRC, “More Realistic Analysis of Spent Fuel Pool Progression”, Risk Information Conference 2007. Y.H. Cheng, C. K. Shih et al, “Atmosphere Puff Model Development in PCTRAN”, 15th International Conf. On Nuclear Engineering, Nagoya, 2007.